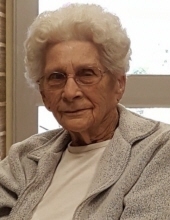 Theresa M. Reeder, 97, of Eldorado, passed away, Saturday, April 13, 2019 at the Eldorado Rehab and Healthcare. She was born in Eldorado on February 12, 1922 to the late Paul and Frances (Rummele) Doerr. She was a home maker and a member of Eldorado St. Mary's Catholic Church. She was married to Dalph Reeder and he preceded her in death. Surviving are her grandchildren: Leslie (Alex) Ego of Eldorado and Rita Burnham of Henderson, KY. Two great grandchildren, Kaitlin and Paxton Ego of Eldorado. She is also survived by two special friends, Janet Bayless and Pat Jones. She was preceded in death by her daughter Marie Davis in 2018 and her brothers. Funeral services will be held on Wednesday, April 17, 2019 at the St. Mary's Catholic church at 1:00 PM. Burial will be in Douglass Cemetery. Visitation will be held from 11:00 AM until 1:00 PM at Watson Funeral Home. To send flowers or a remembrance gift to the family of Theresa M. Reeder, please visit our Tribute Store. "Email Address" would like to share the life celebration of Theresa M. Reeder. Click on the "link" to go to share a favorite memory or leave a condolence message for the family.